Las Vegas - The Jeep® Wrangler was recognized as the "Hottest 4x4-SUV" for a fourth consecutive year at the 2013 Specialty Equipment Market Association (SEMA) trade show in Las Vegas. The SEMA Award recognizes vehicle models that specialty equipment manufacturers believe are the best platforms for accessorization and that showcase the year's coolest products. SEMA President and CEO Chris Kersting presented the award to Pietro Gorlier, President and CEO of Mopar, Chrysler Group LLC's service, parts and customer-care brand, at the Las Vegas Convention Center. "Consumers are increasingly interested in customizing vehicles, so having an accessory-friendly platform is important," said Kersting. "The Jeep Wrangler has consistently ranked Number One as the Hottest 4x4-SUV since the inception of the SEMA Award, a clear reflection of its versatility." "It's amazing to have the Jeep Wrangler recognized for a fourth straight year by SEMA with this award," Gorlier said. 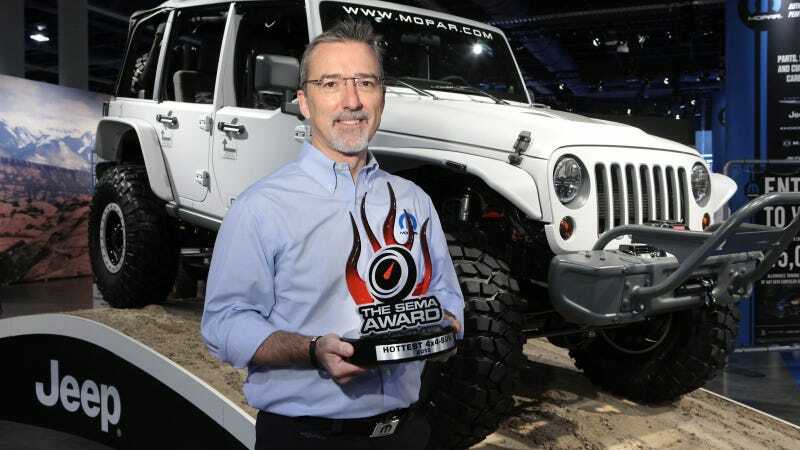 "The Wrangler is our most accessorized vehicle and to see it consistently winning accolades is a demonstration of the quality of the vehicle and the work that Mopar has put in to develop accessories and quality Jeep Performance Parts. Enthusiasts will be happy to know we have just added new offerings to our more than 300 performance parts and accessories already available for this vehicle to provide even more options for customization." 2014 Jeep Wrangler Trail Rated Kit: Strap it up and tow it along with this Trail Rated kit, which includes a durable, high-quality tow strap and two heavy-duty D-rings. A pair of gloves is included for protection and the kit is transported in an attractive Jeep carrying bag. Front Axles: Engineered to exact specifications to bolt into any Jeep Wrangler from 2007 to 2014, these production front-axle assemblies come completely assembled and provide the next level of off-road performance. The Dana 44 axles include a 4:10 ratio, 5 x 5-inch bolt pattern and an electric locker with an available wiring kit. Rear Axles: Engineered to exact specifications to bolt into any Jeep Wrangler from 2007 to 2014, these production rear-axle assemblies come completely assembled and provide the next level of off-road performance. The Dana 44 axles include a 4:10 ratio, 5 x 5-inch bolt pattern and an electric locker with an available wiring kit. Hardtop Headliner: Three years of development and testing were involved in creating this kit. The high-density foam-backed non-woven fabric serves a triple purpose, enhancing the appearance of the hardtop, boosting the efficiency of the Wrangler's HVAC system and providing a quieter ride environment. Available for models 2007 and newer. Black Grille: Juice up the Jeep Wrangler with personalized style by customizing it with a satin black grille. This Mopar accessory is a direct, easy replacement to the production body-color grille, and also features the hood seal and a matching black Jeep badge. Side Visor: Sunshine is a delight — up until it becomes a distraction. The fold-down Mopar side visor for the Jeep Wrangler is a low-cost, easy-to-install defense that blocks sidelong sunlight glare that can pull attention away from the road or trail.